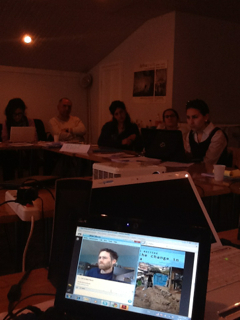 Today was my second opportunity to present to Public Journalism Club in Yereven, at the invitation of Seda Muradyan. This a group of journalists, working with new technologies and approaches, especially for the upcoming election. It’s excellent to present GroundTruth’s experiences, particularly Map Kibera’s 2010 Referundum monitoring, which shows how maps and journalism can really connect for a powerful story. That’s a very small video of me, talking to a patient audience through a translator. I’m still amazed that anything like this is possible on our planet. The group has set up an Ushahidi instance, with OpenStreetMap base map, to monitor elections: http://iditord.org/. Look forward to seeing how the Armenian election develops.